As you said it was a 1975 estimate at 60Gb for Ghawar. URR and even OOIP grows with time as you may discover new reservoirs or apply new recovery techniques. according to Fredrik Robelius, the URR for Ghawar is somewhere between 60 and 100Gb. i think JD's somewhat obscured point was that the 1975 estimate has been used by "doomers" to make a point about saudi arabia peaking. obviously that estimate no longer applied. JD's point is that Ghawar must have a URR of considerably more than the 1975 estimate thus showing the early estimate to be wrong. This tells us the OPEC revisions mentioned here might also be considerably higher than the 1975 era estimates and there might be some truth behind current OPEC reserve figures. We don't know much about what goes on in OPEC or Saudi Arabia. The only thing we do know is that OPEC countries revised what they told the world in a highly suspect way with the motive of obtaining larger quota. Any discussion based on geology is hopeless since we just don't have the information. You need to read the last line of sentence on the same slide: "How wrong could 1975 Exxon, Mobil, Chevoron, Texaco estimate have been"
Clearly the author's opinion is that the 60 gb URR is an under-estimate, but it can NOT be off by too much, definitely not wrong by 3 times. A reasonable assessment is the URR is some what higher than 60 gb but in any case more than half have been produced and it is clearly in decline. Clearly the author's opinion is that the 60 gb URR is an under-estimate, but it can NOT be off by too much, definitely not wrong by 3 times. I can NOT be? not even a 1% probability? are you sure? site sources please. A reasonable assessment is the URR is some what higher than 60 gb but in any case more than half have been produced and it is clearly in decline. really. more than half has been produced? you have data to back that up? ghawar is in decline? clearly? please site some sources. for crying out loud dude, you can be much more effective if you stop with these absolutes. i would have said: "it's likely that ghawar is already in decline only we don't know it yet". to the topic at hand, chris v, very interesting point. we are fairly certaint that kuwait fudged their numbers (although frankly i am not 100% convinced yet) but maybe that's not a trend in OPEC. If you looked at a few slides before Ghawar, it discussed the situation with the Yibal field, which is really frightening! The lesson we learn from Yibal is that due to application of advanced extraction technology, the Hubbert Peak may not occur at 50% oil produced, the technology can actually help you to maintain high production well beyond 50% produced, and the peak may not occur until 70%, 80% or even 90% of produceable oil have been produced. And then, as you approach 100%, there is a very rapid decline, or in another word, total collapse of the field in just a few years. The same thing could happen to Ghawar since the same technology is applied there. We are well beyond 50% production already in Ghawar, if the 1975 estimate has some credibility at all. We may be at 70% or 80% of oil produced already but production is still high only due to advanced technology. The longer the high production level lasts, the quicker the collapse when it eventually comes, just like the case of Yibal. Had Ghawar followed the textbook Hubbert curve and begin declin at 50% we could have been better off by a long and slow decline. But since we are well beyond 50% already we will see a short and rapid decline period very soon. The slide is my source and I do not need any other source. The point is all big four American oil companies made their estimates of 1975 and come to the same conclusion. They have very good geological data to back it up and these are experts who earned their bread and butter doing field works. Mean while the Saudi government comes up and provide a number which is 3 times higher, and they provide no geological data to back them up, and they don't show how they get their number. Whose data do you trust more? The current Ghawar production rate is already below its historic high. I do not have my source at hand but when I do I will post it here. The current production rate is still pretty good but that does NOT mean you have another 50% of oil to produce. As the case of Yibal shows, you can still have high production at 80% or even 90% of oil produced, and then the production suddenly collapses in just a few years. That could happen. The Ghawar Field was discovered in 1948. Production began in 1951 and reached a peak of 5.7 million barrels per day in 1981. This is the highest sustained oil production rate achieved by any single oil field in world history. So current Ghawar production rate is already below its historic high. At the time that this record was achieved, the southern areas of Hawiyah and Haradh had not yet been fully developed. 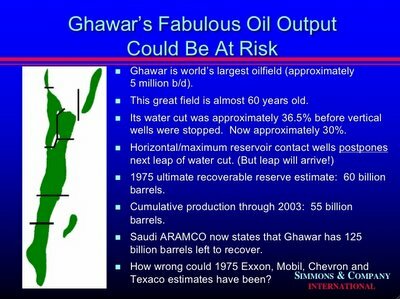 Production was restrained after 1981 for market reasons, but Ghawar remained the most important oil field in the world. nothing in your source says ghawar is in decline. however, you need to understand i'm not arguing that your opinions are without merit, i'm arguing about your annoying style of stating conjecture as unassailable fact. they're not. maybe it's a language thing. anyway, i am frankly also very concerned that the decline of modern oil fields will be way beyond the 3% decline that many hope would provide a "soft landing" post peak. i'm on the fence about gwahar and other big fields in the middle east. it seems impossible to get an objective set of data, every piece of data i've seen so far is driven by agenda. simmons would have us think that only 35-40% of the oil is recoverable, saleri tells us there's enough oil in aramco's fields for 50 years with a "comfortably sustainable" 12mbd. Yes I noted the sentence you quoted. In 1981, when the 5.7 mbd record was set, the southern parts had not been developed. In the 90's, the souther part IS developed, so the total from Ghawar exceeded 5mbd but it is still below the 5.7 mbd record. And now, year 2005-2006, it falls below 5 mbd again. Wouldn't you say it is declining? At least you have to admit that the northern part is declining so much than it can't be made up by the developments of the southern parts. quantoken, this is only true if ghawar is indeed being pumped at full tilt. the saudis have made claims that the water cut has remained at 30% for the last decade and that the reason production from ghawar hasn't changed is because they haven't drilled any new wells because there hasn't been any need. unfortunately they haven't shown any evidence to prove this. "the Hubbert Peak may not occur at 50% oil produced, the technology can actually help you to maintain high production well beyond 50% produced, and the peak may not occur until 70%, 80% or even 90% of produceable oil have been produced"
So with that said could one not extend the logic that the hubbert half way point scenario is completely arbitrary in the face of said techologies? The horizontal side-tracked "bottle brush wells" may allow oil extraction from above the oil water contact and delay the major water flood reaching the well as compared to vertical wells. In some places the water broke through to horizontal wells due to vertical faults as fluid channels. Engineers studied fault patterns and drilled wells avoiding fault shear zones whenever possible. When the final depletion curve comes it might suddenly turn at a high angle of descent. "Why is gas $3.00 a gallon?" Some of these modern technologies only allow for faster depletion of fields such as occured in Oman, more than greater final recoveries. Saudis have recanted of the 50 years of maximum production theory and in 2006 a Saudi official stated that if the Saudis will increase to 13 mbod production there might be irreversible declines within two decades. Elsewhere I found an online Saudi statement that the production expansion might be delayed due to lack of drilling assets in place. Drilling more wells into an existing geological structure may speed its depletion. New information you might find relevant. Peak oil doom has never been about running out of oil. It's about increasing demand versus stagnant or decreasing supply and it's relationship with the geometric growth inherent in our financial system. If anyone is so sure Ghawar isn't in decline post a single reference showing that please. I do enjoy the many blogs of how we CAN go without oil for many things but no one mentions that we DON'T. Funny how you would like us to provide references about Ghawar ebing empty yet, you can't provide anything saying that it is in decline. Funny that. Maybe it is, maybe it isn't who the hell knows. I get tired of Matt Simmons bantering. For what he thinks we're nice and doomed too. So why the "peak oil" tours de france and what not? And one more thing, while it isn't so much about running out of Oil, you will find that it is about running out of oil. I've got to say JD your bolgs on here are wuite witty and funny. I haven't laughed this hard in a while. I actually has tears when I read the part about your power going out. LOL.